If your little ones love cebeebies they will love this cute cloudbabies soft sensory toy. If you have not heard of it, its a pre school program where the characters who are all babies learn about colours and the world around them. My two toddlers watch cloudbabies so when this cute teddy came through the post it was world war three. Who would open it, who got to hold it first. It's sad to say the 1 year old son son can throw a hefty punch and he won the toy. The toy is aimed at 18 month plus and has some parts that provide some sensory stimulation. 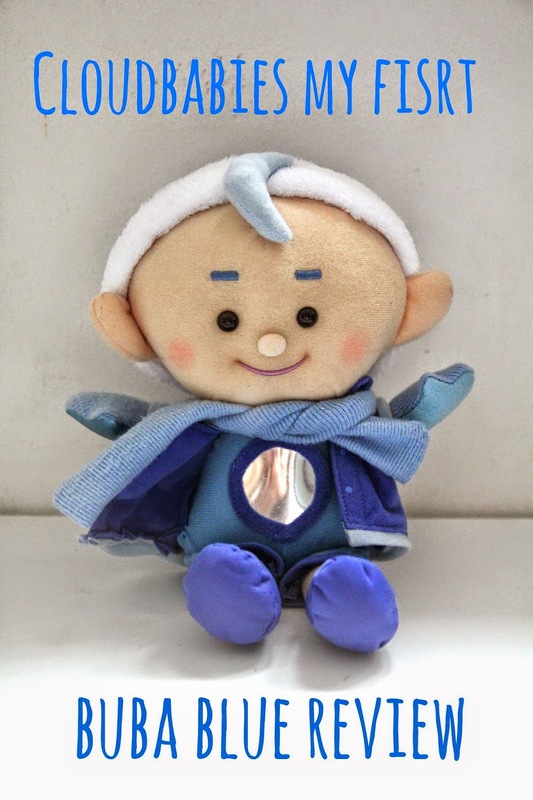 Buba Blue has a little bell and jingles when you shake it. I know this as they wouldn't stop shaking it singing jingle bells (kids it's April). It also has a little Velcro jacket that you can undo and there is a little mirror, Son son tools great joy in seeing himself in it and kissing himself in it. Ami who is 2 and a half loved the ideas of getting the cloudbabies dressed. She was practicing how to get him dressed by tying the little scarf and doing up the jacket. Every time son son would undo it she would tell him off "son son stop It he will get cold". They like to play looking after the cloud baby and whooshing it around. The toy is very soft and son son has taken to having it in his cot with him. My only negative is for the cost you do not get a lot. It costs £19.99 I know for character toys you pay more and it is a decent size. You can get buba pink also with the other ones to be added later in the year. A great toy for any cloudbabies fan. Oh my goodness how cute is that! Amy would love it!